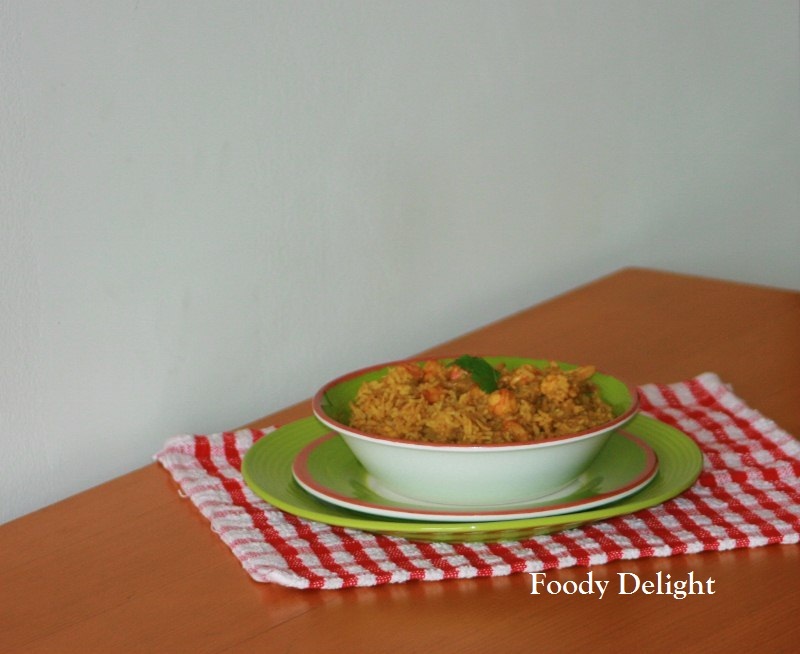 Shrimp biryani or prawn biryani is one of the delicious one pot meal during sunday. 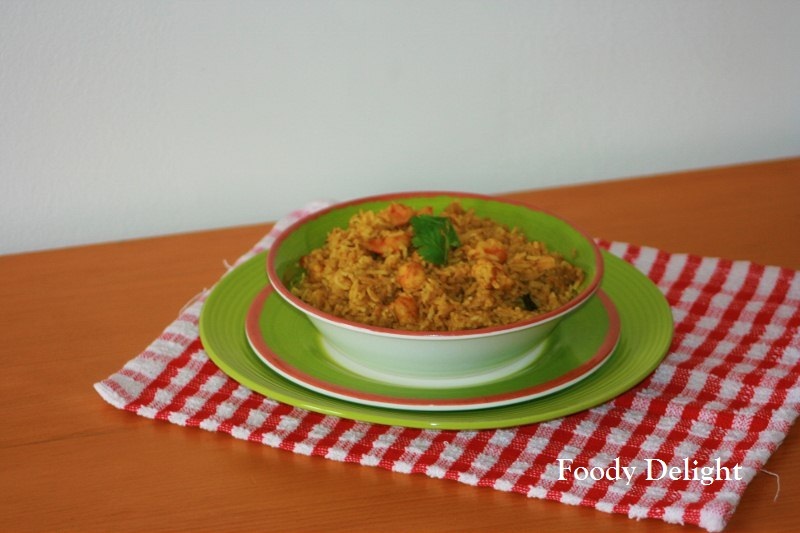 This dish brings out the best flavour when you make biryani with fresh shrimps. Just enjoy this super delicious biryani. Combine yogurt, red chiily powder, tumeric powder, coriander powder, cumin powder, garam masala and salt into ine bowl. Mix well and make a smooth paste. Then add cleaned shrimps ans mix well. Let it marinate for atleast 1 hour. Add tomato, ginger, garlic cloves, cilantro and green chillies into blender and make s amooth paste. Wash and soak Basmati rice in water for about 20 minutes. Heat oil into one pot and add cloves, cinnamon stick, bay leaves. Fry for 2 minutes. Then add sliced onion and fry till the onion slightly changes its colour. Then add marinated shrimps and mix well. Cover and cook till shrimps changes its original colour. Now add grounded paste and cook till raw smell goes out from paste and till the gravy becomes bit dry. Then add washed rice and 3 cups of hot water. Mix well. Cover and cook on high flame till you see that all the water is absorbed by the rice. Now turn the flame on medium position and allow the rice to puff up. This may take about 20 minutes. When done, turn off the flame and keep the lid open. Gently stir the biryani without breaking the rice. Shrimps biryani is ready to serve hot. Yummy Biryani.. Looks so delicious..
Like the idea of eating biryani with shrimps. Yum! 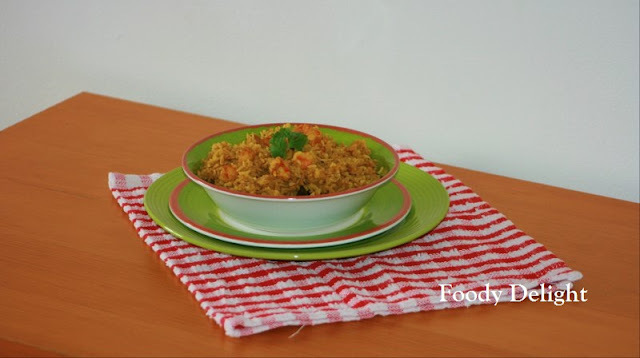 I love briyani ... Nice recipe..